We are indebted to the wife of the late Lieutenant Colonel J. P. Barden MBE, Mrs. Susan Barden, for permission to publish this account of Ngoma's first voyage. We also acknowledge, the assistance given by Lt Col N J Bird OBE of the Royal Artillery Yacht Club and others in researching this story. Captain J. P. Barden, R.A. When I am resting at my moorings at Poole and thinking over how I came to have a yacht in England I am very surprised that the whole idea ever succeeded. 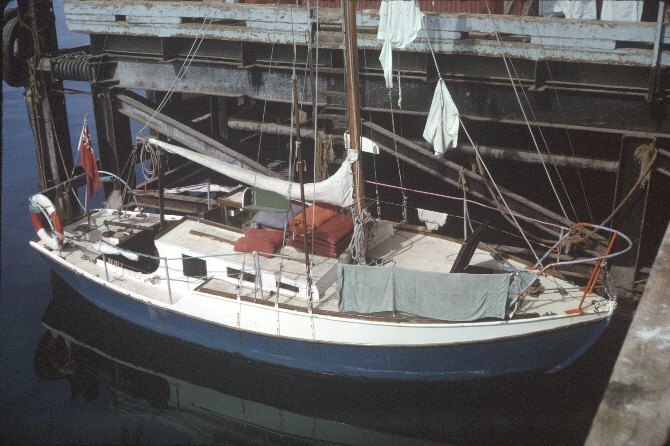 Before I left England in 1959 I had decided that I would sail home from Africa; thus I set myself the task of building a five tonner and sailing it to England from Dar-es-Salaam. It was much more work than I thought it would be, and it was only my concentrating on this single aim with an obstinate determination for two years that made it possible. This article may encourage others who feel that they want to do something more than stay in barracks for the next few years to try the same thing. First I had to decide what type of yacht I would need for this voyage, and I set myself as a standard something that would stand up to English Channel weather. This was mainly because, when I started, I knew no other water and also in fact the Channel can at times be as bad as anything that I would like to meet. The yachting monthly “Eventide” appeared to me to be good enough and also was considered just possible for an amateur to build. The “Eventide” is a hard chined yacht with wide deck and large cockpit. It is 24 feet long, and I put three bunks below together with a galley and a chart table. I had great fun getting started on the building, selecting the timber to build in and finding a supplier, then laying down the building stocks and building a shed. I used a very good local wood called Miningia for the hull and frames, and put plywood on the decks. On the way home I often used to think back to the building days. Every evening I used to go over to my shed at the back of the Officers Mess of the Sixth Battalion K. A. R, with whom I was serving, and work away for three or four hours. Quite often another member of the mess would walk over with a glass of bear, to see how work was progressing; I think they used to wonder if I would ever finish. But one problem after another was solved: someone to cast the keel for me, a method of steaming timber, where the money was to come from, or even how to join four pieces of wood together at one place all at odd angles. So, eighteen months after starting, and allowing time away on military duty my yacht was ready for launching. She was taken down to the sea on a two wheeled trailer a very worrying procedure and launched in Dar es Salaam harbour on the 3rd April 1962. I named her Ngoma after the Regimental march of the Sixth Battalion K. A. R. and she had her first sail fifteen days after launching. It was a great success and the same day I was so confident I went straight out to sea before hitting the town for a night off. Now everything had to get into top gear, for it was only four months before the time I planed to leave for England. I had been buying charts and books for the voyage home from the start, and plan to make the 8,000 mile trip up the Red Sea and onto the Hamble via the French Canals. The timing of each section was important and I found that the best time of the year for me to go North up the East African Coast coincided with the “run-out date” of my tour. My plan was to go up on the tail end of the S.W. Monsoon and to be in the Red Sea at one of the quietist times of the year. This was going to mean reaching the Mediterranean in November, at which time the Eastern half looked reasonable and the Western half to far away to worry about. I actually made arrangements to go through the French canals in December, and when I wrote to find out if they froze up received a very non-committal letter in reply. As things turned out I did not get further than Malta and, considering the winter of 62-63, this was a lucky break. I arrived a fortnight late at Malta and the chances of sailing N.W. in the Western Mediterranean in December are almost nil. But Admiralty wind and current charts will show why I had to leave Dar es Salaam at the end of August. The 5,000 miles to Malta is full enough of memories, contrasting the glorious sailing and constant sun with the fear of being run down and the fatigue. The greatest thrills came from defeating the mountainous seas and the worst moments are those when the engine has failed and the sea is so calm you do not think it will blow for a week. But back to the beginning. Sailing trials went on in Dar es Salaam and all kinds of fittings were made bellow. She came out of the water for three weeks whilst I fitted the engine and fresh water tank, which also served as a cabin table. The final bolting down of the engine was done afloat, and then came provisioning. I reckoned on 1000 lbs. of stores as the limit, for water, fuel and food. There were also the charts, my tools, our personal gear and all manner of odds and ends. While this was going on I had to look around for a crew; I decided I wanted two others. In the end I found two, neither of them could sail, but both, for one reason or another, were travelling from Africa to England. David Melville, a Rhodesian who worked very hard on the boat before sailing, wanted to visit England and Bob Smith, who turned up about a fortnight before we sailed and was returning to England the long way round and was serving in Nigeria. They were both good friends and worked well, but never became really keen on sailing and got bored with the long periods at sea. David dropped off at Aden and went back to Rhodesia; he was short of cash and I think this is why he gave up. This meant that from there on we were only two, which made watch keeping very exhausting; but we soon fell into a routine, each of us with his own job, and we knew what to do without a word or reminder from the other. So all was at last ready; the Governor General, Sir Richard Turnbull, came to see us off and I quickly thanked all those who had helped and advised me, and then left. About a dozen yachts of the Yacht Club escorted Ngoma out of the harbor entrance, the shore of which was lined with Askaris of the 1st Battalion The Tanganyika Rifles with the band playing from the jetty. It was all very moving, but soon we were on our own and heading for the open sea. My first port of call was to be Mombassa, A short way up the coast, where I intended to stock up with fresh food and then head for a really long leg. The first hop was a very pleasant sail indeed under perfect conditions; there could be few places in the world with such good sailing as there is around Dar es Salaam. We took Ngoma outside Zanzibar because of the reefs inside and enjoyed swimming over the side and a little fishing. I was able to introduce the crew to the problem of dealing with shipping at night and had to start proper watch keeping. Ngoma felt the pull of the East African Coast current which was to carry us nearly to the Horn of Africa already it was giving us almost two knots for twenty four hours a day. The Yacht Club at Mombassa made us very welcome, and some friends of mine came down from Nairobi so in the end I had very little shopping time. The club made up a gap in my charts and also gave me one of the West Coast of India and Arabian Sea, incase we were taken there by mistake; the Admiralty Pilot speaks of a 6 knot current heading N.E. of Cape Guardafui so perhaps they were being serious. We were having some very good parties but I was keen to be off, as to some extent I was still fighting the clock. The next port was to be Mogadiscio, the capital of Somalia; this was the only place where I thought I would get fresh water before Aden. On a Sunday morning I went ashore early to buy some eggs and some bread before finally filling up with some water and then sailing. A cheer from the shore and we were away, then round the headland into the heavy swell and there it was, the line of light blue water, and we left the dangerous shadows of the reefs behind. Except for the call at Mogadiscio the speed with which Ngoma went up this coast was astounding; thank goodness we were not racing. I kept about 30 miles off the coast and followed the 1,000 fathoms sea contour. The charts warn mariners of the strength of the current, but at noon everyday I had to add twenty or thirty miles to the Dead Reckoning position to allow for the current. Up to Mogadiscio Ngoma managed about 120-130 miles a day over the ground, and I became a little concerned that I would go straight past the port. The seas piled up astern and then went crashing on leaving us surrounded by foam, but all seamed well so on we went, heaving-to for supper and seeing very few ships; in fact I think only two passed us. Getting into and out of the protection of the breakwater at Mogadiscio is something I do not wish to do in a S.W. monsoon again. There is a 100 dash yard stretch of water in which to turn and get behind the wall which is filled with ten foot waves breaking and pushing their way onto the rocky beach. Once in we lay to our anchor as far in to the harbour as we could get, but there was always a heavy swell and we never once made the journey to the shore in my rubber dinghy without getting soaked. The authorities were helpful but advised me to wait a fortnight as the wind and sea would be down by then; but I pointed out that it was this very wind that I needed to get to Aden. Originally I had decided not to take any beer onboard because of space, but the British Embassy there gave us a crate, so from then on we were able to have a lunch-time beer as an evening glass of whiskey. I walked out to the end of the breakwater to try to make a plan for getting out and decided to leave at high water. I had to go out on the engine as the wind and sea were coming in together, but I had some sail up just in case it was needed. Just when I thought we would be alright three waves broke in front of Ngoma; all I could do was to keep the bow straight into each and from being outside the breakwater we were back inside. The water lifted the bows and tried to push the stern under but the stern buoyancy saved her again and the engine just got us out. In the lee of one of the cargo boats we hoisted the mainsail and were off. In the next four days Ngoma covered 640 miles non-stop. The seas were too big to think of heaving-to for supper and we helmed by keeping the stern square on to each wave rushing up from the South and letting the little ones running off their sides splash aboard. This was sailing. The mainsail soon came down and we ran under twin head sails, the no 1 jib and Genoa; but for the last two days only the no 2 jib was up and we logged 185 miles on the chart for the third day. Nothing could stop us, toppling seas chased by foaming across the deck it seemed to build up to incredible heights above us, then the stern would lift and, gripping the tiller, we would wait until suddenly we dropped into the valley. But the helmsman had to be ready, for the next and even bigger wave would already be there appearing to be about to engulf the whole yacht. The navigation was now more important than ever; I was using a sextant almost for the first time and the excitement was tremendous; but the sun was always clear and one got used to taking a fix from such a moving platform. At one noon sight the suns altitude was 89˚ 15’ S; we had missed being perpendicularly under the sun by 45 miles. But our luck had to be tested and, having found the headland of Ras Hafun in visibility of about 6 miles, I realized we were too close to the shore for comfort. Rounding the headland about three miles off we ran into terrible seas of every description. Bob gave me the tiller, as he considered it was getting too difficult to hold and we all stayed on deck. One thing was helping us a great deal and that was a canvas lining I had made for the cockpit rather like a bath; this caught all the water coming on board and stopped it going bellow. The only sail up was the no 2 jib, but the canvas screens on the handrails around the stern also made quite a lot of windage. We seemed to be nearly clear of the race when Bob tried to photograph one particular wave which took offence, drew reinforcements from each side of it and nearly shut the sun out, before breaking like a waterfall into the cockpit. It was a shattering experience. David on the foredeck was dry, but the cockpit was full and the cabin doors off their hinges, down bellow I could see a foot of water in the cabin. Still, the water was warm and the seas gave us a break to bail out with buckets. By nightfall repairs were complete and all we had lost was the Halford Safety light, washed burning into the cockpit, and Bobs camera ruined. The night that followed was rough to say the least, so we put the odd warps over the stern and the mainsail cover but still we ran on. Without any canvas she was unmanageable, so I had to accept the sail biting at the wind. It really was a wonderful night – a full tropical moon I the sky, blowing a good force 8 and surrounded by a silver mass of moving water. By 2 o’clock I decided to try to heave-to for some sleep and managed to get some sail up, with all hands on deck but she would not come round until all the warps had been taken in; so for a little time we were a little pushed, then all was well and we went bellow until dawn. In the morning the wind was down and twenty four hours later we were round Cape Guardafui and heading for Aden. The change was complete, the wind had gone and the swell was about two feet high. The contrast left us weak and relaxed. On went the engine and a noisy, hot three days were spent sleeping on deck pushing towards Aden. We were now amongst real shipping, day and night tankers and cargo ships were going past. Just short of Aden the engine failed through over heating and we were held up through want of wind, and when it came it was a westerly one with a short sea. Ngoma, with bilge keels, is not the best of beating yacht designs and she often great trouble in making any agreeable headway in a nasty sea. We spent four days within 100 miles of Aden unable to get on, and had to break into our reserve of water which was really for the Red Sea. This was three hundred half-pint tins, each filled with distilled water, which had been made by a Dar es Salaam firm for me. This proved very useful for water rationing as I could give each of us four tins a day each day very easily, and some for the cook. In the end we reached Aden on the same day as the Yemen Crises started, but all three Services did everything they could to help make our stay there enjoyable. We saw a good deal of the town and gave ourselves a break for a few days before preparing to go on. I would have taken a lift up the Red Sea if one had been readily available, but I failed to arrange one so decided to sail. The problems with the Red Sea are many: it is fairly narrow with uncharted reefs, filled in the centre with 20,000 ton ships doing fifteen knots, and flanked by a waterless desert harbouring pirates and murdering tribes. Add to this the fact that the wind blows from both ends into the centre; it is therefore easy to get in, but a long beat to get out. Nevertheless it was time to be off; we had a very good start and Ngoma was soon rolling up the Red Sea in grand style. It went like clockwork – a land fall of an island at last light checked with a star sight and a light house before first light. I soon got into the habit of wanting to know just where I was at last light before it got dark, rather than at first light which is when most navigators take their star sight. We had a very good sail up to Port Sudan dodging reefs on the way into port, and having to use the engine for the last hundred miles some of the time when we ran out of wind. Quite often in the evening a bird would come and settle on board, he would land on our arm or leg whilst at the helm because he found it easy to grip. Then for warmth at night he would move up to our shirt collar; I in fact can claim to have taken an evening site with a bird sitting on the sextant. The sunsets were very beautiful often colouring the whole sky in delicate shades and sometimes including the green flash in the centre. Port Sudan was very clean and much more crowded than I expected. The harbour police were very active and although our personal freedom was not restricted we had to be very careful about money and purchases. After two or three very pleasant days we sailed again. Northwards headwinds may be expected most of the time so we were faced with an 800 miles beat. I used the engine quite often when beating in light airs or when a small sea was running as, with such a shallow draft and an eight foot beam on a water line length of twenty feet, successful beating is not always possible. Just north of Port Sudan Ngoma had to run through the reefs at last light to get clear before dark, and then on the wind again and off to find the shipping lane. Playing the making tack the whole time, all seemed to be going well when the engine failed. The decision was quickly made to go back to Jidda, the nearest port, because it did not look as though we would ever get up the Red Sea without an engine. The eighty miles run back to Jidda was a very pleasant interlude, just pure sailing without ever having to decide whether to motor or sleep. Jidda presented a navigational problem, particularly because I did not have a good chart of the approaches; the port is protected by three lines of reefs and it is dangerous to approach the land until you have fixed your position. Using star sights, and in particular the Pole Star, I approached the land until the glow of the town could be seen and then waited until dawn. I had tried the impossible task of making a map of the reefs from the description in the Admiralty Pilot with little success. But with a light breeze in the morning Ngoma found her way to the last gap, when a pilot boat took our line and towed us in. Once I had told them why I had come in, help was quickly found, and with the aide of one spare part I had bought in Aden an Italian tugman fixed up my engine. A British sea-captain made us his guests, and was a great help in making contacts in the town for provisioning. For I wanted to be away as soon as possible so, having taken on fuel and water, we sailed and a week after turning round we were back on the same latitude making steady progress. On one occasion Bob was quite convinced we went straight over a reef in the middle of the night, whilst on another a British tanker stopped and passed across a crate of beer to help us on our way; so life was not all dull. The Brothers were reached and left behind, and then came a black two days getting through the straights of Gabel at the southern end of the Gulf of Suez; approaching the entrance at midnight with a favourable tide, the wind suddenly got up and set a nasty sea running. I soon gave up, turned around and ran under the shelter of an island until dawn. As the tide had now turned we went round by an inshore route intending to try again that night. In the afternoon the Rudder Post touched a coral head through going too close to the shore and caused a water leak up the propeller shaft. Having anchored where we were I soon stopped the leak with caulking cotton and threw the heavy anchor over for the night as we both needed some sleep. In the morning we could not get the anchor up as the chain had wrapped itself round the coral. The water was very clear and much deeper than I thought so I had to cut the chain and loose the anchor. But twenty four hours later, after a day and night of beating and rock dodging, we were clear and able to get on again. I had quite a number of books onboard and when stuck for an idea I would read up what previous mariners had done. This encouraged me to experiment with sail settings and navigation when my own knowledge was running low. But the hardest lesson I was learning was that on a long voyage time is not so important. I was used to weekend sailing and racing in England, during which ensuring that one was back for work on Monday was always a factor in any decision. It took me a long time to learn the benefit of a day becalmed, spent resting and repairing; the only way to learn this is to sail without an engine. The last seventy miles to Suez took nearly four days, we even tried rowing. There was no wind, and it was very hot with land on each side – rather like being in the middle of a large lake. Beating north, back and forth, was not helped by the fact that each night the southbound convoy was released from the Suez canal at about midnight. Keeping clear of the tankers in the middle and the rocks on the side, when the shore lights are almost non-existent, can be a little testing. But then came a puff and in one days sail Ngoma made the entrance to the canal which I promptly sailed straight into. This caused a great shout from the shore but got the point across that I did not want to hang around. My sights were set on reaching the Mediterranean as soon as possible; so Ngoma was provisioned and watered at Suez as I did not want to call at Port Said which was now unnecessary. The engine was also repaired at a cost of £10 which was the first labour charge I had had for work on the yacht that I might have done myself since I started building. Once the pilot was onboard we were off and in two and a half days were in to the Mediterranean at last. Now for Crete and Greece, and before long I slipped into the Iraklion in Crete in the evening light. Europe again – the shops – the people – oh! How we noticed the change. Suddenly we both felt an even keener need to get on and try to be home for Christmas. So after much debating we decided not to go north to Athens, as I had at one time planned, but west to Malta. On this sail we realized that winter was upon us; it got cold at night and I used to have a lighted hurricane lamp on the cockpit floor for company and warmth. It started getting dark much earlier and now in contrast to the Red Sea where we had put our clocks on an hour to give us a longer evening, we found that we were having our first evening whisky at tea time. We were now working three hour watches and changing over cook at tea time with a glorious washing-up session; the new cook washed up that he started with everything clean, and did not stint his own cooking for fear of having to clean it all up. We had fallen into a very firm routine, we knew who would fill the lamps and when the lunch had to be served so that the need for conversation died a little, and usually only picked up when another ship went by. We had two gales on the way to Malta, the first stopped us for a day and the second helped us. The second blow was quite severe and for twelve hours we lay a-hull and came to no harm. I then used the try-sail for the first time and was very pleased with the work it did. Although there was plenty of tinned goods on board the log records the day when fresh eggs ran out, followed by bread, potatoes and butter. The colder weather was changing our habits and a cold lunch was not enough. From the start we had had a hot evening meal of stew, curry or spaghetti but now we tried to knock up something extra at lunch time. But Malta was getting nearer and after taking a number of doubtful sights in the main gale we sailed into Grand Harbour at last light on the 28th November 1962. It was just dark and there were three other boats trying to get in, calling up the coast guard and flashing each other in Morse. I do not know Morse and on the way home soon realized I should have learned it; when a cargo boat calls you up at night, or stands by you for ten minutes in heavy weather to see if you are alright, it’s a great pity if you are unable to reply except by shining a steady white light on your sails. Once safely in Malta, the longer I stayed the harder it would be to leave. The local advice was against going on and the more I studied the weather charts the harder it seemed it would be. So when the Navy said they would take Ngoma home on the day I planned to sail I gave in and flew home instead. I have no regrets for I had achieved quite a lot from the day I selected a piece of wood 6 – by – 4 to make the keel. As a postscript to this log, in December 2006 we heard from John Marshall. I have just read the story of Capt Barden's voyage in the Ngoma in your newsletter No.2. I thought that it might be of interest to you. Below is the photo John took all those years ago. Many thanks John! Ngoma in Jeddah harbour. This little craft had been built in East Africa by an officer in the King's African Rifles. He and a friend were sailing it home from Dar-es-Salaam. However, in the northern Red Sea he had to use the engine to make progress against the strong northerlies which live in the area and, as Murphy's law dictates, it packed up . So he diverted to Jeddah for repairs. He didn't have any detailed charts, but he made it. Anyone who remembers the area will agree that that was quite a feat. We invited them aboard for a bath and a feed and although the ship's liquor was locked away I believe we were able to fortify them from the 'medicinal' supplies.